In February 2016, during a protest against the lack of accommodation for students from poor backgrounds at the University of Cape Town in South Africa, students and members of the #RhodesMustFall movement set alight paintings considered to be ‘colonial artwork’. Among these paintings removed from the walls of some residences at the university, were also the paintings of black anti-apartheid artist, Richard Baholo. The burning of Baholo’s artwork prompted many critics of the #RhodesMustFall movement to question the thoughtfulness of the student protests during which universities’ property and buildings were also destroyed. 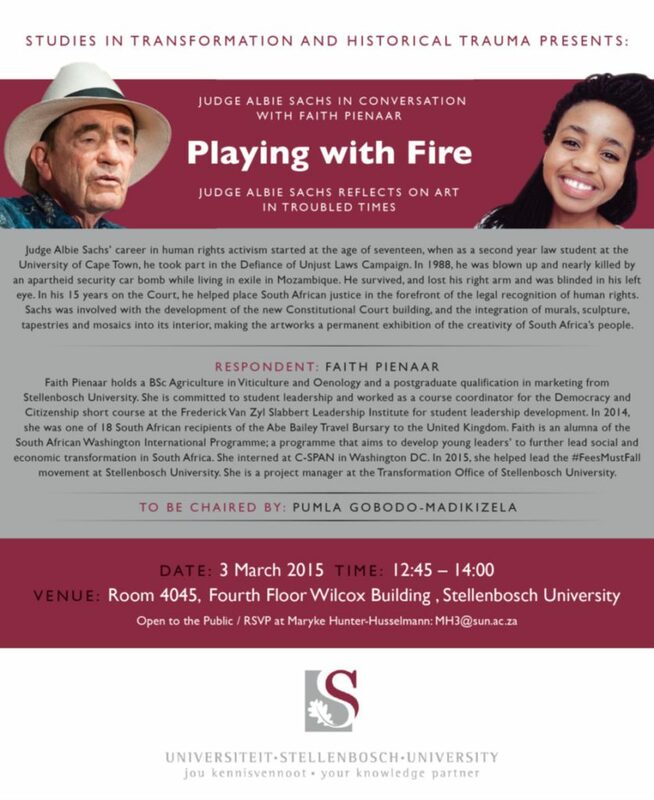 In a conversation with Faith Pienaar, Project Manager at the Transformation Office at Stellenbosch University, anti-apartheid activist and judge Albie Sachs reflects on the meaning of art in troubled post-apartheid South Africa. This conversation, held on 3 March 2016 and hosted by the Studies in Transformation and Historical Trauma department at Stellenbosch University, came at an interesting time, where art has taken on various meanings and has become central to the struggle for transformation among students at universities. In his conversation with Faith, Sachs discusses the meaning of violence and the destruction of buildings and art during student protests. He particularly makes reference to the ways in which the works of Fanon have been quoted by students engaged in violent protests, pointing to the different contexts in which Fanon wrote his work and that within which the students find themselves. Furthermore, he talks about the different ways in which protesting is approached by the current generation in comparison to previous generations. In talking about the thoughtfulness of protests by earlier generations, Albie Sachs suggests that the ways in which students have approached protesting requires much deeper thinking about not only the ‘how’, but also the implications of acts such as destroying university property. This is an interesting intergenerational conversation between both Faith and Sachs as it interrogates the nature of the ‘revolutionary struggle’, how it is understood and responded to by students and revolutionaries across generations. In response to Faith’s question about whether the approach taken in 1994 to building and ‘reconciling’ the country was the right path, whether it validated the hurt and pain and promoted healing, Sachs mentions that the process of negotiations pre-1994 and that of developing the constitution was not as easy as it is often thought to have been. Though challenging, the process of developing the constitution, according to Sachs, gives students the right to protest and speak out against a lack of transformation, however, what it does not give people is the “right to go and destroy the very corridors of learning that students want to be opened.” For more on this conversation please see the video of the conversation below. Mandisa Malinga is a part-time research assistant in the Studies in Transformation and Historical Trauma department at Stellenbosch University. She recently completed her PhD in Psychology which explored constructions of fatherhood among precariously employed African men in South Africa.